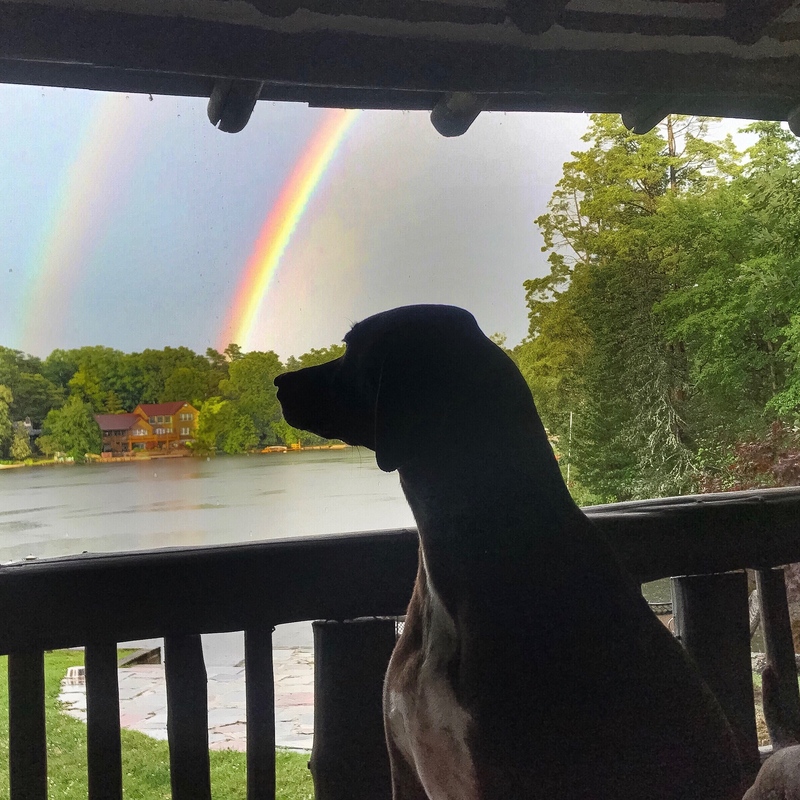 We were lucky enough to see a DOUBLE rainbow from our porch this summer! Rita and Limoncello have both earned their Rat I title (Instinct level), and both have one qualifying run for their Rat N title (Novice level). 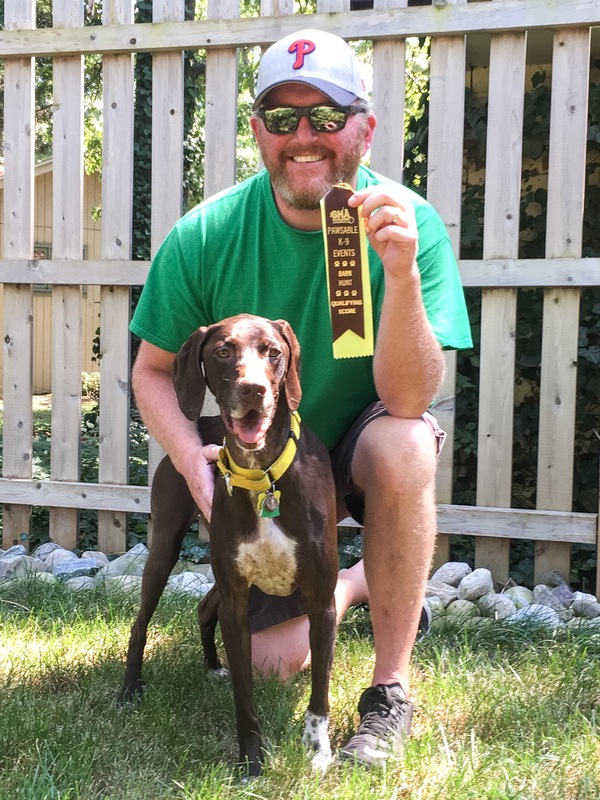 We attended a barn hunt at Tail Wagging Events to see if we could both secure at least another qualifying run in the Novice level. Unfortunately, neither team was able to do so, but we once again had a great time with our pups! Siffing out a rat…or not! 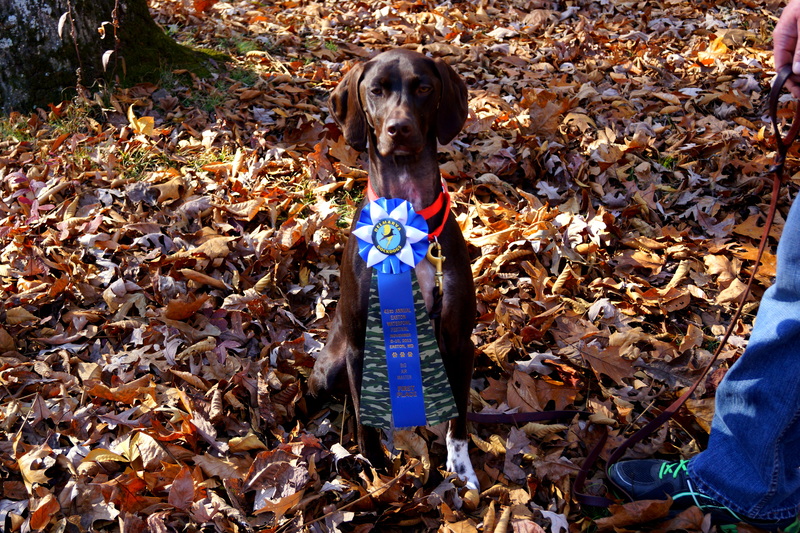 Our second Barn Hunt Association trial was held at Pawsable K-9 Events. Both Limoncello and Margarita did very well this weekend! Both gals ran 2 Novice runs, and both secured one qualifying Novice score toward their Novice title. The Novice level requires the dogs to find the tube containing the rat, complete a tunnel, and have all-fours up on a hay bale (in no particular order) within two minutes. Cello and Rita will need two more qualifying scores to earn their Novice title. *For those of you wondering why we participated at the Instinct level when Rita is already titled at this level, you are allowed to still do an Instinct run to get your pup warmed up as long as the dog has not titled in Novice. Rita’s First Qualifying Novice Score Ribbon! Instinct Run: Brian called the wrong location of the rat. *For those of you wondering why we participated at the Instinct level when Cello is already titled at this level, you are allowed to still do an Instinct run to get your pup warmed up as long as the dog has not titled in Novice. Novice Run 2: Cello executed the tunnel and the hay bale climb, but Brian called the wrong location of the rat. Cello’s First Qualifying Novice Score Ribbon! Overall, we had a fun day, and enjoyed Barn Hunt with our two little gals! Lager’s first official dock diving competition! In less than 2 weeks after Lager joined our pack, we were entering him in his very first official DockDogs competition! Three Rivers DockDogs hosted an event at Cabela’s in Triadelphia, West Virginia. Hooch was up on the dock when a gust of wind blew a banner off of the side of the pool, freaking him out completely . It was a tough weekend, as Hooch had a difficult time gaining enough confidence on the dock to run and jump at his full speed. This was Lager’s first attempt at EV. Lager missed both times, but was very determined – we had no doubt that he will excel at this in the future! 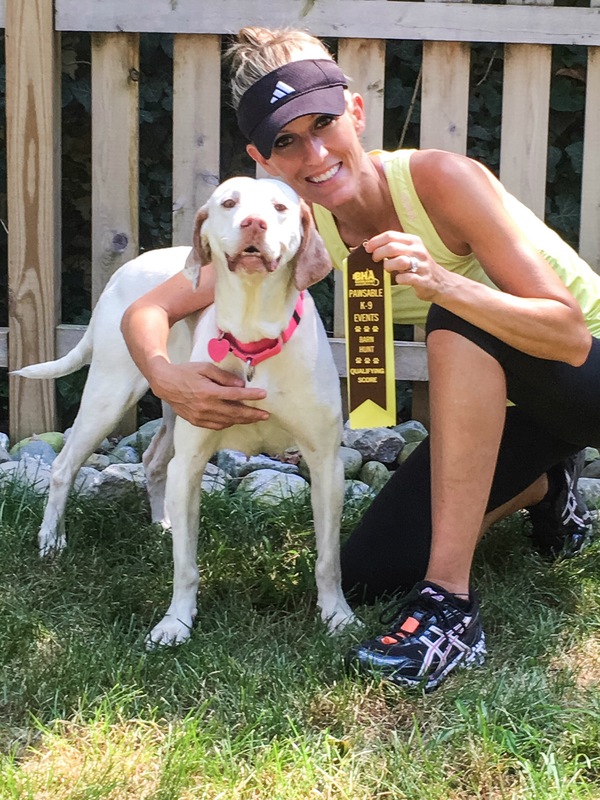 None of the pups made the finals at this event – first time all season!! There were some HUGE jumping dogs here! We had a great weekend camping with friends, and enjoyed watching Lager have a blast on the dock at his first official event! 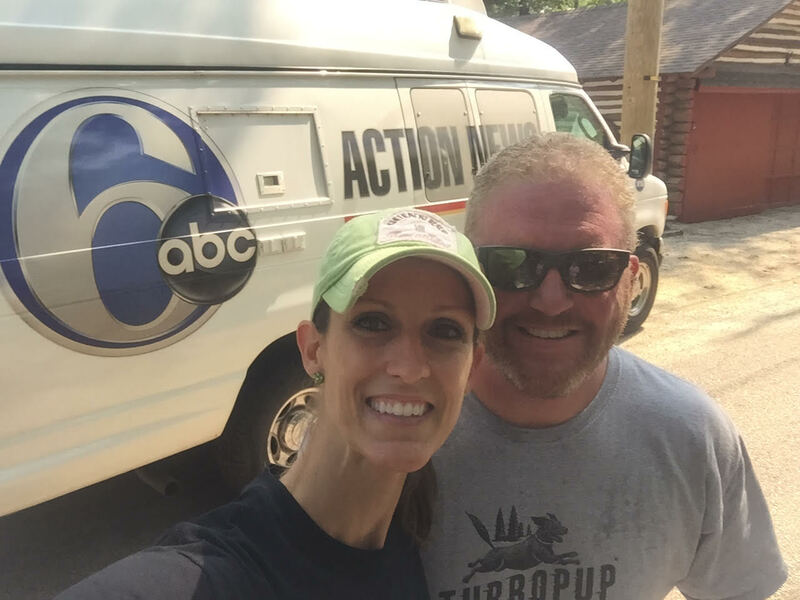 The Liver Killers on 6 ABC News! The Liver Killers first time on the news! Nora Muchanic visited us at our home to do a story on the Liver Killers! 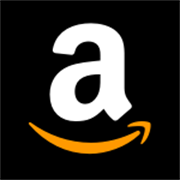 See the full story, plus a video of the news segment – click HERE! Most people just walk their dogs. But Jenny and Brian Beadling’s dogs go for a flying leap. 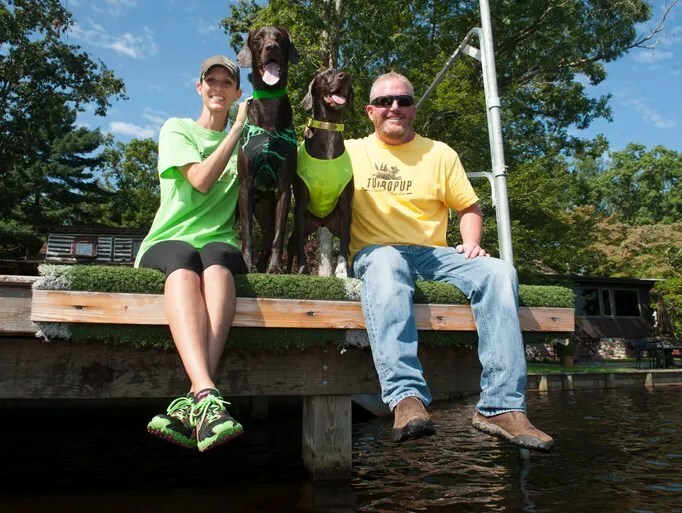 The German Short Haired Pointers (GSPs for short) are two of the top dock diving dogs in the country and also rated internationally. The dock at the Beadling’s Medford Lakes cabin has become a launching pad as these two pooches practice each day. In competition they are judged on how high, long and fast they can jump. A room inside the Beadling’s house is filled with ribbons and medals. 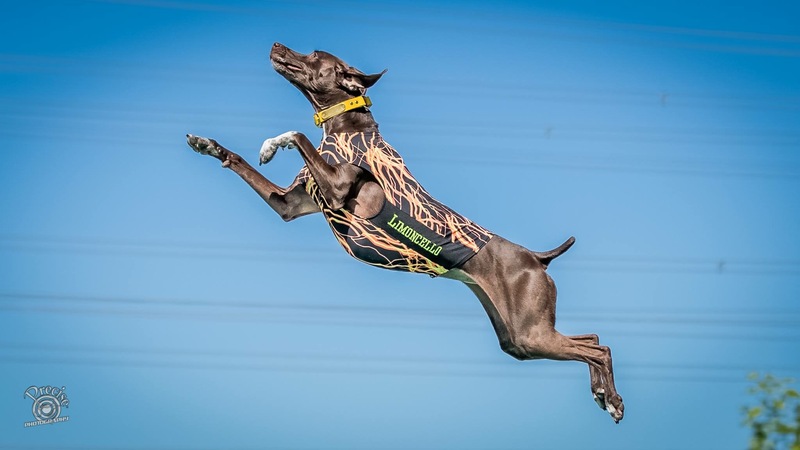 Hooch is the number one ranked GSP in the country for “big air”; Cello is ranked number one for “iron dogs”, the canine equivalent of a triathlon. The newest member of the family is Lager, a former bomb sniffing dog for the U.S. government who served in Iraq. Now Lager regular leaps into the lake with his new companions. He is clearly adjusting to his new digs. They are highly trained and these dogs may be world class dock divers, but if you ask me they look like they’re just having fun. Jenny a special education teacher and Brian a mortgage banker, travel with the dogs to competitions several times a month. 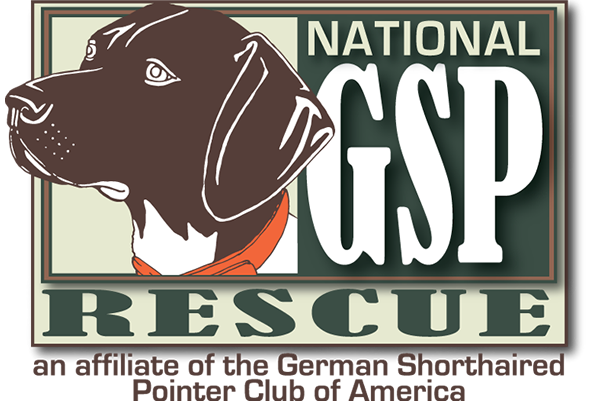 The cash prizes Hooch and Limoncello win are turned over to a GSP rescue group.